One of the most popular bodybuilding workout schedules is a five-day split, in which you train one of five parts of your body on a each day of the week. This allows you to hit each muscle group with a large amount of training volume and intensity, and gives it a full week of recovery before you train it again. While there are many ways you can group your muscle groups for a five-day workout, one of the most effective is to have a day each for legs, chest, back, shoulders and arms. Get your muscles warmed up before you lift. Since 150 to 300 minutes a week of aerobic exercises are recommended for a healthy adult, you can sneak some of that in before your bodybuilding workout. With warmed up muscles you can ease into your routine. Train your legs on the first day of the week. The reason for this is two-fold: first, leg training will be your hardest workout, so you should do it when your energy levels are high. Second, many people choose to bench press on a Monday, which means you likely won't have to queue for the squat rack. Start your workout with five sets of five heavy squats. According to Charles Poliquin, owner of the Poliquin Performance Center for elite athletes, rumors that squats are bad for your knees or back are untrue. However, to prevent injury, you must do them with proper form. After squats, perform leg presses, hamstring curls and calf raises, for four to six sets of eight to 20 repetitions each. Train your chest the day after your legs. Strength coach and bodybuilder John Meadows recommends starting your chest workout with a dumbbell press variation. After this, move on to a machine press, then dumbbell flyes or cable crossovers, then finish with bench presses -- either flat or on an incline. 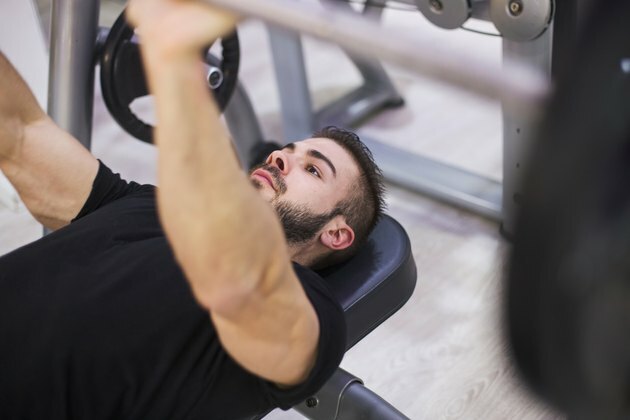 While you may be used to benching first in your routine, Meadows advises that doing it last is much safer, because your joints are more warmed up, which is less likely to lead to shoulder and elbow injuries. Have a rest day after your chest workout, then train your back on day four. Start your workout with a deadlift -- one of the best exercises for building a strong and muscular lower and middle back. Strength coach Jim Smith advises using perfect form when deadlifting: make sure your abdominals are tensed, your back is arched and the bar stays close to your body. Work up to a maximum set of three to five reps. After this, perform dumbbell or barbell rows, then finish with chinups. If you can't do body-weight chinups, try band-assisted ones. If body-weight chinups are too easy, use an added weight. Begin your shoulder workout with a standing military press. Use strict form for all your sets except your last one. On the last set, perform as many strict presses as you can, then do a few extra reps as push presses -- using your legs to help drive the weight up. Finish your workout with a few sets of lateral raises, reverse flyes and barbell shrugs. Use light to moderate weights for all of these, with a slow tempo, and hold each repetition in the top position for one to two seconds. Your arm workout will be the least physically demanding, so save it until the end of the week. To get an efficient workout, superset your biceps and triceps exercises. This means performing a set for your biceps then immediately doing a set for your triceps, resting and then repeating. Include two biceps exercises -- one using dumbbells and one using a barbell -- and two triceps exercises. One of these should be a pressing movement like a close grip bench press or parallel bar dip, and one should be an extension movement, like a skullcrusher or pushdown.